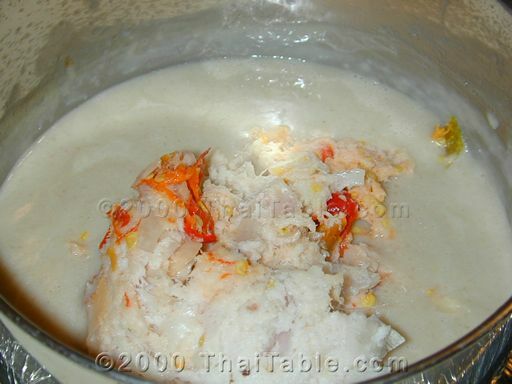 Pla rah lohn is one of the chili sauce dishes that many Thai people enjoy at home with their family. It is one of my favourite dishes because I love the variety of fresh vegetables that can go with it. 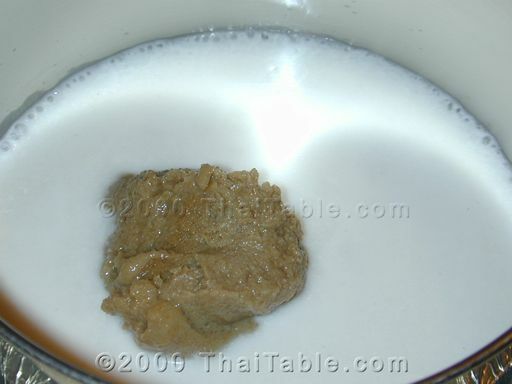 There are many recipes to make pla rah lohn. Some calls for garlic, kaffir lime zest, galangal, lemon grass and other ingredients. My mother tried them all and we decided: Grandma's recipe was the simplest and the best. One of my favorite vegetables to go with this dish are pak paew (the green leaves with the purple stems you see in the right of the picture above) that is frequently available at Oriental markets. It is a widely used vegetable in Vietnam. You can use mudfish or catfish. I grill mine first or grill it a day ahead. The aroma from the charcoal gives the fish a wonderful distinct flavor. Remove the bones and skin from the fish. 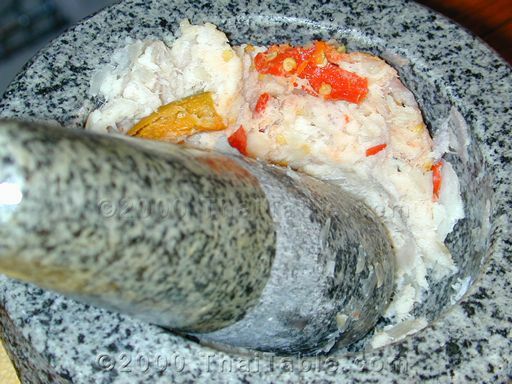 In a mortar, pound the grilled fish and shallots together until the shallots are no longer recognizable. This is a good time to remove any bones that might have escaped your eyes from the first round. Add chili peppers and pound lightly if you don't like it hot, otherwise, go for it. 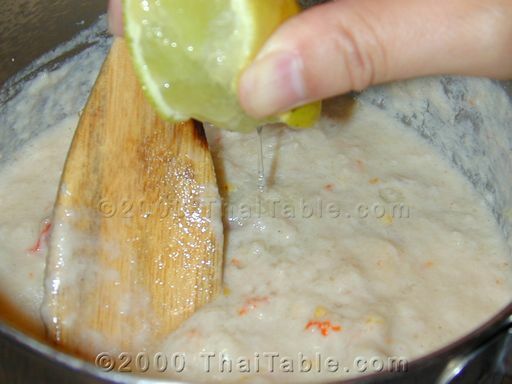 Over a low heat, add the coconut milk into a sauce pan or small pot. Add pickled fish to the pot. Let boil and stir for 2-4 minutes. Turn off the heat. 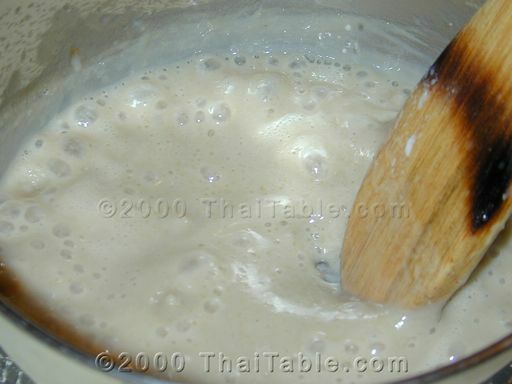 Add the pounded mixture to the pot. Squeeze lime juice in. You might need more or less lime depending on your taste. We like it sour in our house, so I use the whole lime. Stir the mixture together. Serve in a small bowl. I top it with a few chili peppers for garnish. 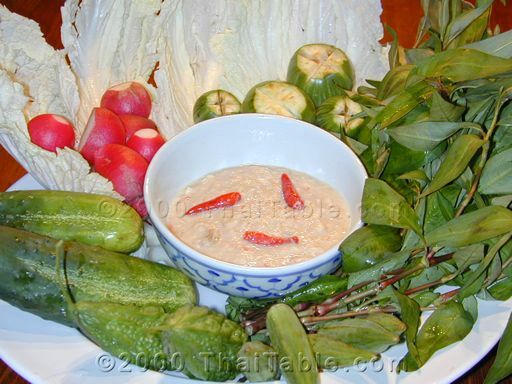 Traditionally pla rah is served with fresh vegetables such as Thai eggplant, cucumber, Thai olive leaves, banana flower, bamboo shoots, napa cabbage, wing bean, bitter melon, white turmeric, 'pak paew' just to name a few. However, there are different types of leaves that are available in the US that I found to go well with pla rah. I would recommend radishes, green beans, arugala, and other garden vegetables besides the Thai vegetables that you can find. We like to heap our spoons with a mixture of vegetable on rice, add a teaspoon of pla rah lohn, scoop up the rice, veggie and sauce and eat!